Here is a way to make a quick, healthy snack. (although it disappears pretty quickly too) A friend brought these to knitting night last week and shared with us how she makes them. 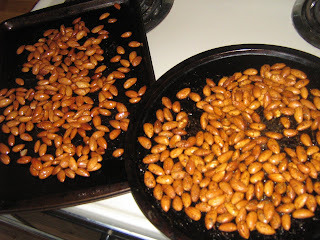 One batch of almonds is coated in a few spoonfuls of maple syrup. The other is coated in coconut oil mixed with spices (I used chili powder, garlic, salt, and oregano). Then they are put in the oven for about 15-20 minutes until they are nicely roasted. The boys gobbled down the sweet ones pretty quickly - I barely managed to snag a tiny jarful to share with a friend, and hubby finished off all the spicy ones on a recent fishing day. He has requested that I make them even spicier next time, I think his thinking is that if they are super spicy then he won't eat so many at once and they will last longer. Do you have an actual recipe, or did you just wing it? Wah! This sounds yummy but we just finished all the almonds that I ordered from RV. Seems like seasoning them would only make them disappear faster in this household. Guess I will have to order way more next time. I don't actually, and it didn't occur to me to ask for specifics. I only ever think of recipes as a general guideline anyway, so I never bother to get those details. Samantha, Shelly told me how to make them so you could ask her.